This specific post is a direct continuation of the previous one from the part 14, so the database at the moment should have the FactOnlineSales table already partitioned. 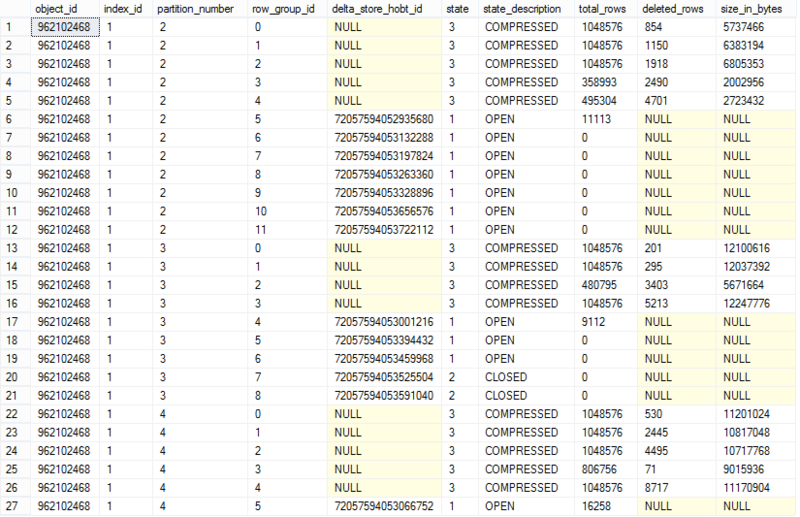 It looks like we are actively using 3 partitions with a total of 14 segments distributed over them. Well, now it looks like we have got a new Row Group – a new Delta-Store, which was located on the partition that we have updated. Notice, that we have also have a number of rows deleted on each of the Segments, which makes a perfect sense since as I already explained before – the update operation is actually an Insert of a new rows into the Delta-Store plus an updated of the Deleted Bitmap with marking the respective original rows as deleted. The sum of the deleted rows over the 2nd partition is exactly equals to 11113 rows inserted into a new Delta-Store, and so this way we see that the operation was executed correctly. Lets check our internals situation: Awesome! We have updated a different partition and it has automatically created a new open Delta-Store which is local to this partition, and so now we have a situation of 2 Delta-Stores being simultaneously open for the same table. Note: Partitioning has a lot of potential for the applications which require a lot of updates and inserts into the Clustered Columnstore Index – if you manage to do the inserts into different partitions there will be a great potential gain of speed and avoidance of the Clustered Columnstore Locking which as already tested uses IX and X locks on the active Delta-Stores. Looks fine actually :) Our partition number 4 was the only one being accessed, so those numbers should correspond to the sizes of the partition Segments. The execution mode is a Batch Mode so everything is fine here, and the operation itself is being paralleled and so the query is fine. 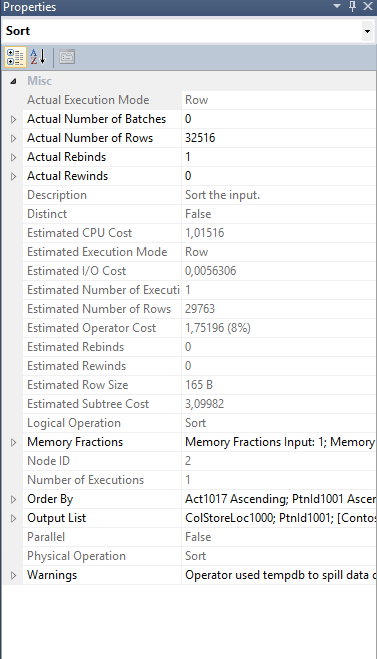 One other important mention deserves the “Sort” operator, which is being executed in the Row Mode, while Microsoft is already promoting that the Spill operation has been upgraded in SQL Server 2014 to be executed in Batch Mode. 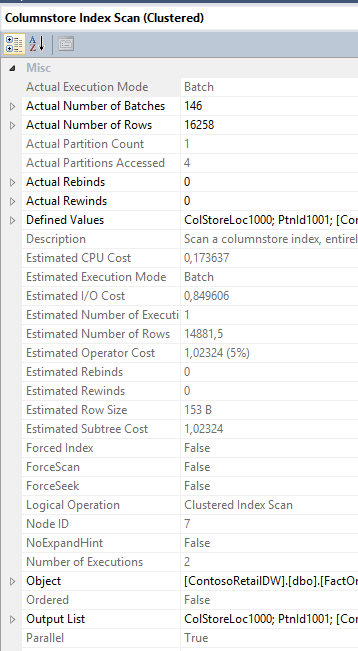 Maybe because there are just 32K rows being sorted, the batch mode decided to take a rest and only operations over 100K do Spill in Batch Mode, but I was quite disappointed to see it not being applied to the Clustered Columnstore Index update operation. Maybe this is a product of the CTP1 – I don’t know, but I will be testing this functionality in the upcoming blog posts more thoughtfully. I decided to play with the Lock escalation on the Clustered Columnstore Indexes, and so I decided to update around 2/3 of the table, in the hope that this would produce enough locks to block the complete table. If you notice a big number of Row Groups being locked, it's because some of them were created during update operation, while others were actually the product of several Update & Rollback attempts. Also, the Row Groups which have an U (Update Lock), are actually empty (no rows and they are marked at the OPEN state). In this case we observe a different behavior: we still have our Row Groups U (Update) and X (Exclusive) locks, but we also have an IX (Intent Exclusive) lock on row of our partitions (that we update completely, but note that partition 1 has no row at the moment), an IS (Intend Shared) lock on the partition we are updating a certain percentage of rows, and IX (Intent Exclusive) lock on the 4th partition which will not be updated at all. Here comes the image showing the results of the content of the row groups, which were created as the result of this blog post - every time we update the segments - new Delta-Stores are being created, and since we execute rollback on our transactions, the Row Groups stay open until Tuple Mover should recycle them. Note: I have noticed a lot of times it does not happen correctly, but I think that it should be corrected before RTM. It seems that the partition level lock escalation works, though its functionality in a TABLE mode gets more granular locking, then the one on the PARTITION level. I would have expected it to be functioning otherwise, but lets wait until CTP2 before coming to any conclusions.